Description  What Does A Cockroach Look Like? The american cockroach averages 3-4 cm in length. Their bodies are dark reddish brown with a unique yellow band just behind the topside of the head. Their bodies are flat and oval, which allows them to squeeze into tight fitting areas. American roaches have wings located on their backside, which are used for short flights. The male american roach is slightly larger than the female because their wings extend 3-8 mm beyond the abdomen. American roaches arrived to the United States from Africa in the 1600s. Today they are one of the most common roaches in Florida. American roaches prefer warm and moist environments, but can survive under almost any condition. In their natural environment, american roaches prefer moist and shady areas such as woodpiles, leaf piles and mulch. American roaches spend most of their time outdoors but will venture inside when searching for food or water. During heavy rains american roaches will also move indoors searching for shelter. Once inside residential homes, american roaches dwell between slight cracks and tight fitting areas such as refrigerators, cabinets, tiles and baseboards. American roaches are also common in areas where food is prepared and stored such as restaurants, grocery stores, bakeries and warehouses. The life cycle from the egg to the adult stage is around 600 days. Eggs are deposited in protective hard cases near food. Nymphs surface from the eggs after 6 to 8 weeks. The nymphs differ slightly in color and shape compared to the adult roach. The nymphs cannot yet fly. The adult lifespan for the american roach is around 1 year. Each female american roach will produce an average of 150 offspring in her lifetime. American roaches are omnivores, consuming both plant and animal-based foods. American roaches prefer decaying organic matter but are also opportunistic feeders, feeding on anything in their path including meats, dairy, starches, fruits, vegetables, algae, shoes, clothing and paper. American roaches are also cannibalistic and will feed on each other when the opportunity arises. When infested inside homes, american roaches can produce strong and unpleasant odors. The odor can be detected inside the home and will soak into items the roaches make contact with while scavenging. The female american roach lays her eggs in a hard protective case called the ootheca. On average, the female produces 16 cases per year and deposits them near a food source. The case is brown to black and averages 8 mm in length. American roach feces are tiny, black cylindrical pellets that look like small grains of rice or coffee. A cluster of american roach droppings usually indicates a severe infestation and should be addressed immediately. American roaches carry infectious diseases in their gut, which can be transferred to humans when they contaminate food items. American roaches dwell in filthy places such as sewers, drains and septic tanks. They also pick up diseases such as salmonella on their legs and deposit them on food once inside a residential structure. Food that has been contaminated by american roaches causes food poisoning, diarrhea and dysentery. American roaches can also contaminate utensils, dishes, food preparation areas, countertops and other surfaces. Remove woodpiles, leaf piles and lawn clippings from the exterior of the home. Roaches dwell in this type of habitat. Clean gutters regularly. Debris can build up in gutters and create ideal habitats for american roaches. Eliminate cardboard boxes. Roaches will eat cardboard and use the boxes as a home. Fix all water leaks. American roaches like moist environments and live near areas with access to water. Keep tight fitting lids on trashcans inside and outside the house. Food and used soft drink cans attract roaches to residential homes. Clean kitchen surfaces regularly and rinse off dishes before placing into the dishwasher. Refrain from filling pet food bowls up to unnecessary levels. Pet food attracts roaches and provides a convenient food source. Caulk slight openings on the interior and exterior of the home. Roaches can flatten themselves as thin as a dime and fit into the tightest areas. Use screens whenever possible. Screen windows, vents and drains. Install door sweeps under doors when possible. Make sure doors and windows fit properly inside their frames. Apply insecticide inside and outside when eradicating american roaches from a residential home. Apply insecticide in cracks and crevices, avoiding areas where humans make regular contact. Make sure to also focus on baseboards, entryways and plumbing areas. Allow ample time for drying before allowing children and pets to return. 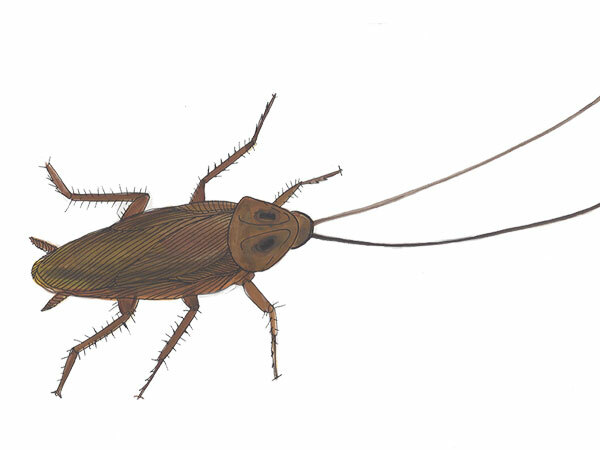 Cockroach baits contain toxins mixed with food, which are attractive for cockroaches. Baits can come in the form of a dust, gel, granule and paste. The advantage of using bait is the low impact to humans and surrounding wildlife. Baits should be placed in areas where cockroach activity is high and out of reach of humans. Cloud Termite and Pest Control has been serving Bradenton roach control and Sarasota roach control since 1934. We are available to assist with all your roach problems. We service Lakewood Ranch roach control, Ellenton roach control, Bradenton Beach roach control, Parrish roach control and surrounding areas. Call us today at 941-746-1147.